The Easter season brings out lots of new Easter candy that is perfect for giving your preschoolers some practice with sorting and graphing. This fun math lesson uses Sweet Tarts Chicks, Ducks and Bunnies for some fun sorting activities. For older preschoolers you can teach this lesson to the whole class. Younger ones will probably do better if taught in small groups. 1. 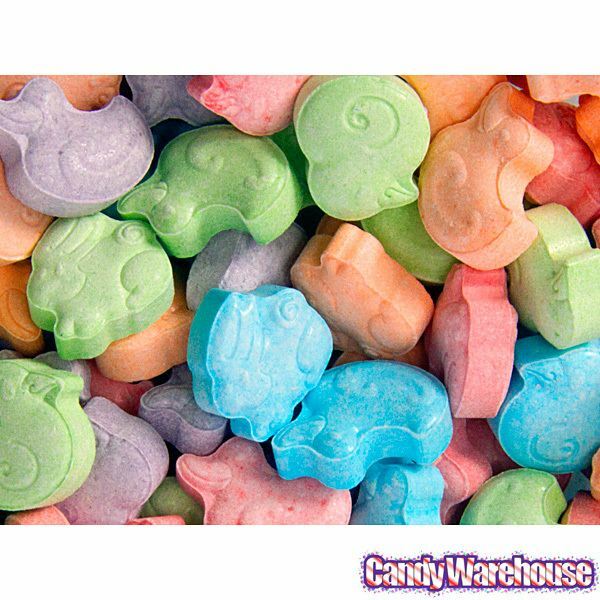 Give each pair of students a cup of the Sweet Tarts Chicks, Ducks and Bunnies and a piece of manila paper. 2. Ask them to pour the candy out onto the paper. What animals do they see? Which animal do they think they have the most of? Let the students predict which animal they think they have the most of. If you want you can record their prediction onto a piece of chart paper. 3. Tell the student to sort the candy into groups of animals. If they haven't sorted before, you may need to show them how to put all of the bunnies together and all of the chicks together, etc. 4. After each group has sorted have them count how many of each animal they have and write the number on the recording sheet. Depending on their age and how many animals there are, some students may need help writing the numbers. 5. Ask each group to look at their paper and circle animal that they have the highest number of. Does it match their prediction? 6. Give each group a sticky note and tell them to write the animal they had the most of on it. To keep it simple you can show them how to just write B for bunnies, C for Chicks and D for ducks. 7. Use the sticky notes to make a class graph of which kind of candy each group had the most of. Discuss the graph. Look at their recording sheets. Were they able to write the numbers? Did they circle the highest number as instructed? Have the students sort their candies again by color. Here are a few more ideas for preschool Easter math lessons and activities. For an Easter math center write a different number from one to ten on ten plastic Easter eggs. Then provide the students with beans and have them count out the correct number of beans and put them in the eggs. You can also write the number on one half of the egg and put the same number of small stickers on the other half and have the students match them together. Make small, medium and large cut outs of bunnies, chicks and Easter baskets. Mix them up and have the students put them order from smallest to largest. Solve simple addition and subtraction problems with the class, giving them candy eggs or jellybeans to use as counters. Your preschool students will have with these seasonal lessons. Be sure to check out these Easter Crafts and Easter books for preschool children too! Based on the author's personal experience as a teacher.